2009 December | Thanks a Glatt! We came here for what I believe was the fourth time I have ever been this past Saturday. Since Shabbat ends early they are open but I think that may be a mistake because while it was nice for them to be open we were the only ones in the restaurant for most of our dinner. So – right off the bat I would recommend it as a date place if you are looking for somewhere low key. The prices are comparable to Le Meraise and Wolf and Lamb so expect to pay $20-$40 per entrée. The ambiance? This place likes loves The Rebbe. They have DVDs on flat screen TVS playing 24/7 showing him as well as other posters and information about him and his works. From what we later found out that the owner was Baal Teshuva which explains the shrine like dedication to The Rebbe. Most of our group ended up ordering the Philly steak sandwich based off of my recommendation. I ordered it again and was not disappointed. The meat was very juicy and the meal was amazing. Ask for the white sauce on the side and cover it with it! My fiancé ordered the ribs and they were quite tasty as well. Most of their food tends to be on the greasy side however the taste is still good. Their menu has steaks (try the Argentinian it’s delicious), chicken, and burgers with a variety of ways they cook them. The service was lame considering we were the only customers however this has come to be the unfortunate standard in the Kosher restaurant world… hopefully someone can prove me wrong sometime in the near future. I would highly recommend this place if prefer a night out in the city where the conversation and your friends are more important than the crowd and plan on seeing myself there again in the future. QUICK REVIEW! I spent all morning today in line and then watching the taping of a new Jerry Seinfeld show called “The Marriage Ref” and was in desperate need for a fast lunch. I walked by this place many times so I figured today was the day I would try it. First impressions were good – the young employee was extremely nice and had a big smile on his face the whole time. Since I am trying to lose weight for a wedding I decided to go with the salad. At $8.99 it is about normal for a kosher salad in NYC. Unfortunately this places idea of salad was way off. 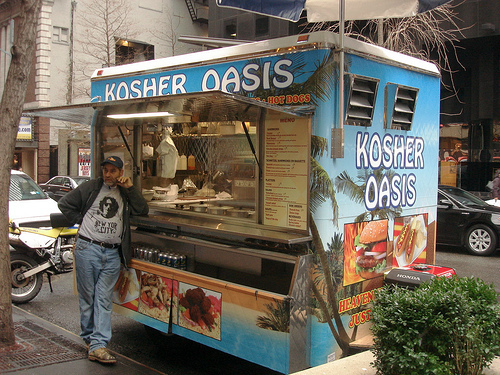 The taste was very good but it looked to be more like what the other NYC vendor carts offer in terms of food. The salad was about 4-6 ounces of meat, rice, and a scoop full of lettuce and pickles. The burgers looked really good although the employee said they weren’t like normal burgers – I plan on going back to try them again.